Just imagine I’m saying this post out loud in Oprah voice. Ready? Oh all right, I’m done. Anywho, just popping in on this day before the weekend to share this awesome giveaway with y’all for a WUSTHOF Classic 7-Piece Block Set to one lucky reader, valued at $300 (psst — it’s the brand’s #1 selling set during the holidays, so you know it’s good). We’re doing this giveaway partially in celebration of the holiday season, but also because it’s the brand’s 200th anniversary this year. Do you know much about WÜSTHOF? Here’s what I know: the company continues to craft all of its cutlery in Solingen, Germany, where the company was established in 1814. Also, the family-owned and family-managed company is led by seventh generation Wüsthofs (I want that last name! ), who maintain a laser focus on providing chefs and avid cooks the best quality knives available in the world. Also, the knives are awesome and cut through anything like butter. I don’t actually own any (sad face), but I have used them in commercial kitchens before and I swear I hear a gospel choir in the background singing “Hallelujah!” every time I use them. Or Oprah voice. Either/or. So here are the giveaway deets: To enter, follow the prompts on the Rafflecopter widget below. There is one required entry, plus a gazillion bonus entries to increase your chance of winning. Giveaway ends 12 a.m. CST Dec. 19 and is open to U.S. residents 18 years and older only. Good luck! But seriously, how does one go about changing her last name from Wise to Wüsthof? Not entering only because I already have my own set. These knives are AMAZING! I’m ready to make some cheesecakes and rib roast! Monkey Bread!! A favorite of ours on Christmas moring for many years :). I’ve decided to make a Beef Wellington on Christmas Eve; I’m both excited and fearful about that! I am excited to make my Red Velvet Cheesecake for the holidays. I will be making a standing rib roast for our Christmas meal…I can’t wait….yum! I’m excited to make my candied walnuts for the holidays. So goooood. I’m going to try making rosettes for the first time. I am most excited to make cherry balls! It’s basically a sugar cookie with a maraschino cherry rolled in the center and then the entire cookie is dipped in a vanilla frosting! I can’t wait to make Panettone Bread Pudding!! P-I-E. Chocolate pie, cranberry pie, apple pie, pie. What a great giveaway! 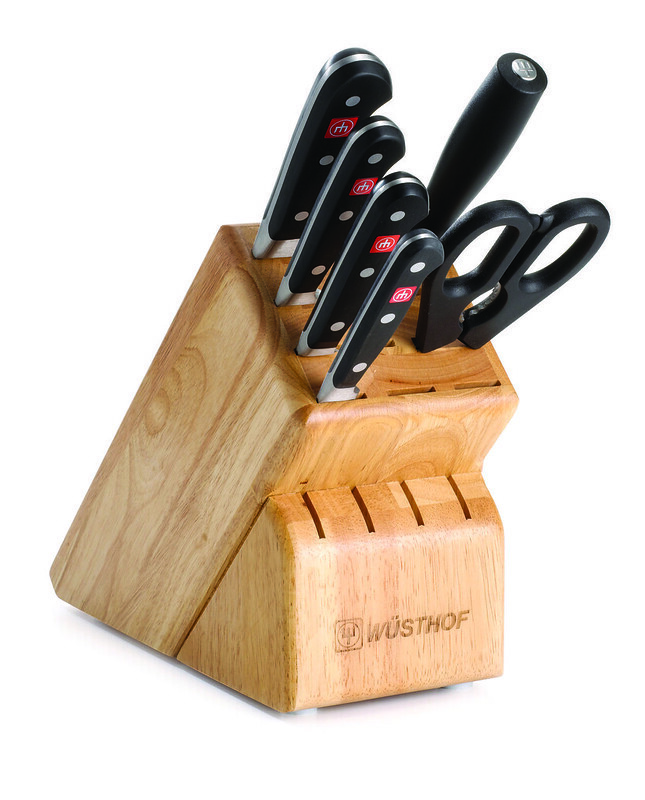 I’ve had a Wusthof knife set for a few years and LOVE it – and would love to gift this to someone on my Christmas list! Knives are something I always say, “Oh, I can’t spend money on that right now.” Then regret it when I’m chopping onions! Good luck everyone! I just told my husband this morning I’m really due for a new set of knives after almost 30 yrs of use. Looking forward to Prime Rib, but mostly my caramels. I usually make a german bread with dried fruit, called Stollen. Peppermint White Chocolate Cream cheese cookies! They taste like Christmas! I am always excited to make my Grandma’s Christmas cookie recipes. It brings back wonderful memories of her teaching me how to bake so many years ago! i don’t celebrate any holidays this time of year so nothing special planned. I’m really looking forward to baking challah. I’m looking forward to making cinnamon rolls! Cutout cookies! They are my grandchildren’s favorite cookie ! I’m pretty excited about making Stollen. In fact, now that I think about it, I might make the first loaves tomorrow or the next day. I’m excited to bake sweet potato pie this Christmas season- I’ve been waiting and waiting to find a great set of knives – would be amazing to win these!! I can’t wait to cook a prime rib roast for dinner along with all the trimmings. I’m excited to make cookies! I can’t wait to make my mom’s sweet potato souffle! I am excited to make gingerbread cookies. I am excited to make cheesecake.